by Subhamoy Chakraborty and Renuka Sane. Credit plays an important role both in consumption smoothing and in fostering entrepreneurship. In this article, we present some facts about household borrowing from a new household survey for the period May - August 2018. We source data from Consumer Pyramids Household Survey (CPHS), a pan-India panel household survey of about 170,000 households carried out by the Centre for Monitoring Indian Economy. The survey captures data on household demographics which includes member-wise characteristics, household amenities such as access to water and electricity, household income and expenses and household assets and borrowing by households. For the purpose of sampling, CPHS creates one or more Homogeneous Regions (HR) for each state from a set of neighbouring districts that have a similar agro-climatic condition, urbanisation levels and female literacy. There are a total of 102 HRs in the CPHS database. The data is captured three times a year (known as a Wave or Round). One wave is completed over four months. The information on incomes and expenditure is provided for all months, while the information on assets, liabilities, and member characteristics is as of the month of the survey. For example, Wave 1 in 2018 would consist of January, February, March, April 2018, followed by Wave 2 that would include May, June, July, August 2018 and Wave 3 would have data on September, October, November and December 2018. If the household was visited in April 2018 in Wave 1, the income and expenditure details would be collected for the previous four months. However, member characteristics, assets and borrowing would be as of April 2018. Borrowings from SOURCE for any purpose: The question is, "Does the household have any outstanding credit from a particular SOURCE?". Here 'SOURCE' includes Banks, NBFCs, Credit Card, Money lenders, Relatives or friends, Employer, Shops, Self Help Groups, Micro Finance Institutes and Chit funds. Debts not belonging to any of these sources are classified as 'Other Sources'. Borrowings from any source for PURPOSE: The question is "Does the household have any outstanding credit for a particular PURPOSE?". Here 'PURPOSE' includes Consumption expenditure, Purchase of consumer durables, Health expenses, Education, Marriage, Housing, Business, Investing in financial assets, Repaying other debts, vehicles. All other purposes are classified under 'Other Purposes'. It is pertinent to note that the database only provides us information on whether the household has accessed credit from a particular source for a specific purpose. It does not provide information on the amount of credit outstanding. We use Wave 2 (May - August), 2018 for our analysis. The sample from the Household Amenities, Assets and Liabilities database includes 1,49,160 households as about 23,000 households had to be dropped in this particular wave owing to non-response. We use household weights to get population estimates for share of households having debt and the distribution of debt across different sources and purposes. We further merge this with the previous wave of the Household Income and Expenses database. This is to ensure that data on household income pertains to the time period before the respondent answers the question on debt. Upon merging with Household Income and Expenses database the total number of households in the sample reduces to 1,47,403. 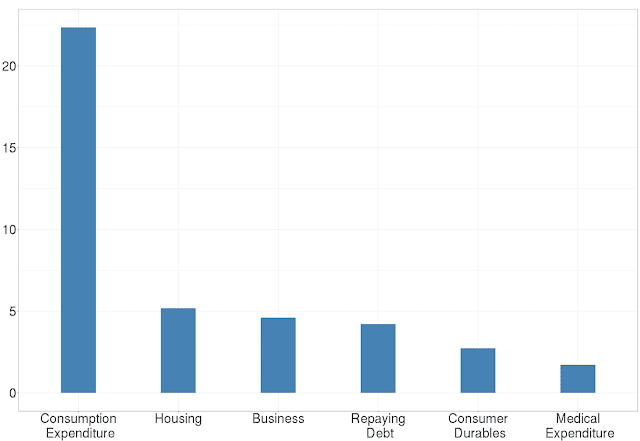 These households are then used to arrive at estimates of how sources and purposes of borrowing vary across income deciles for borrower households. Q1: How many households borrow? Table 1 describes the proportion of households with debt outstanding in Wave 2, 2018. Around 46% (137 million) of households in India reported having debt outstanding between this time period. 46% of rural households reported having debt as compared to 44% of households in urban areas. Q2: Where are the borrower households located? Figure 1 presents the share of households across India, calculated at an HR level, who say they have credit outstanding from any source for any purpose. The Southern and Eastern states such as Telangana (90% of households) followed by AP (80%), Odisha (77%), WB (72%), Tamil Nadu (65%) and Kerala (60%) have a larger proportion of households who claim to have debt outstanding than the Northern States, with J&K being an exception at 90%. Regions represented in white are not covered in CPHS and so data is not available for them. Q3: Where do households borrow from? Formal sources: Any borrowing from banks, NBFCs and credit card debt. Informal sources: Any borrowing from money lenders, relatives and friends, employers, shops or sources classified as "other" by CPHS. 13% of all households have borrowed from formal sources whereas 32% have borrowed from informal sources and 6.6% from semi-formal sources. There is a significant share of households who have borrowed exclusively from one of the three sources, for instance, 9% of all households have borrowed only from formal sources, 27% only from informal sources and 3.6% households have borrowed only from semi-formal sources. Around 3% households have borrowed from both formal and informal sources, 2% have borrowed from both informal and semi-formal sources and only 0.5% have borrowed from both formal and semi-formal sources. A small share of 0.3% households have borrowed from all three sources. Q4: Why do households borrow? Figure 2 presents the different purposes for which households borrow. A household may borrow for more than one purpose and therefore the share does not represent borrowing exclusively for that purpose. Borrowing for consumption expenditure far exceeds other reasons, with 22.5% of all households having borrowed for the same. The next major reasons for borrowing are housing (5%) and business (4.6%). Around 4% of all households report having borrowed for repaying existing debts. There are a lot of anecdotes about households borrowing to deal with health shocks. In this data, however, less than 2% of households reporting having borrowed for medical purposes. Q5: What is the relation between income and borrowing? Figure 3 plots the overall share and sources of borrowing in each income decile. 44% of all households in the lowest income decile have borrowed compared to 40% in the top income decile. Borrowing share is maximum for the fourth income decile households at 50%. Sources of borrowing shows a wide variation across income groups. 36% percent of households in the lowest income decile have borrowed from informal sources while only 20% households in the highest income decile have borrowed from informal sources. Share of informal sources for borrowing peaks for the fourth decile at 38% and declines gradually. Share of formal sources for borrowing shows a steady rise with income. 7% households in the lowest income decile have borrowed from formal sources while 23% in the highest income decile have borrowed from formal sources. 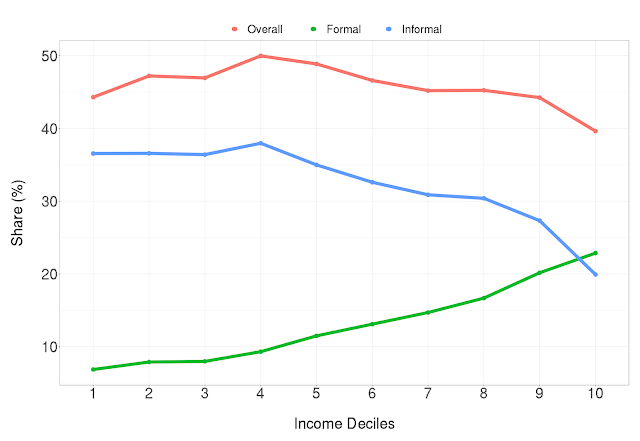 The highest income decile is the only group with more households borrowing from formal sources (23%) compared to informal sources (20%). 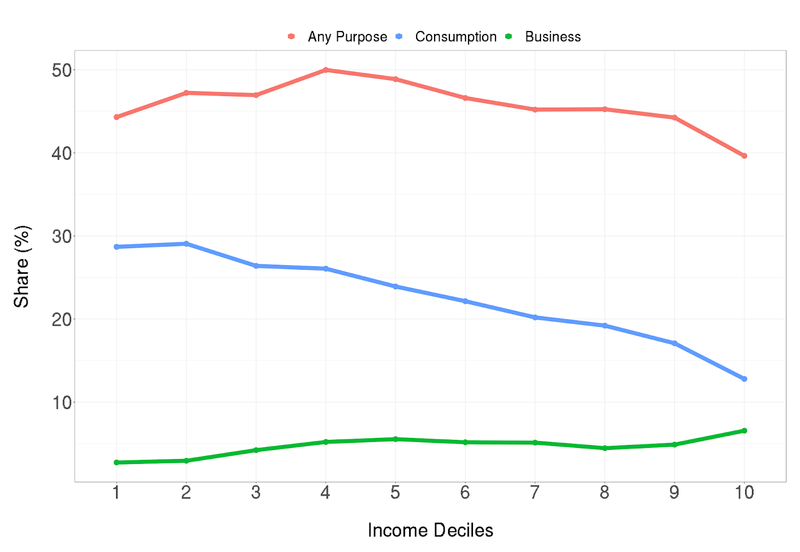 Figure 4 presents the variation in the purpose of borrowing across income deciles. Although consumption remains the single largest reason for borrowing across incomes, it varies significantly. 28.6% of all households in the lowest decile have borrowed for consumption as compared to 13% amongst the highest income decile. Borrowing for business varies less, ranging from 2.7% (decile 1) to 6.5% in decile 10. The line Any Purpose is the same as Overall Borrowing in Figure 3, representing the share of household having debt in each income decile. Around 46% (137.7 million) of households in India reported having debt outstanding between May - August 2018. The share of rural households (46.5%) is larger than urban households (44%). There is a wide variation in borrowing patters across India. In Southern and Eastern states, between 60-90% of households have borrowed. In the Northern states, this number is around 20-40% of households. 32% of all households borrow from the informal sector, 13% from the formal sector, and 6.6% from the semi-formal sector. The data shows a significant reliance on informal sources for the purpose of borrowing. which households borrow. This is followed by housing and business. Almost 36% of all households in the lowest income decile have borrowed from the informal sector. This declines to 20% of all households in the top income decile. The share of borrowing for consumption expenditure declines from about 29% of all households at the lowest income decile to about 13% at the top income decile. The authors are researchers at the National Institute of Public Finance and Policy. We thank Ajay Shah for useful comments. Thanks for the research. Only the top 10% income earners in the country have higher borrowing from formal sources than informal sources. 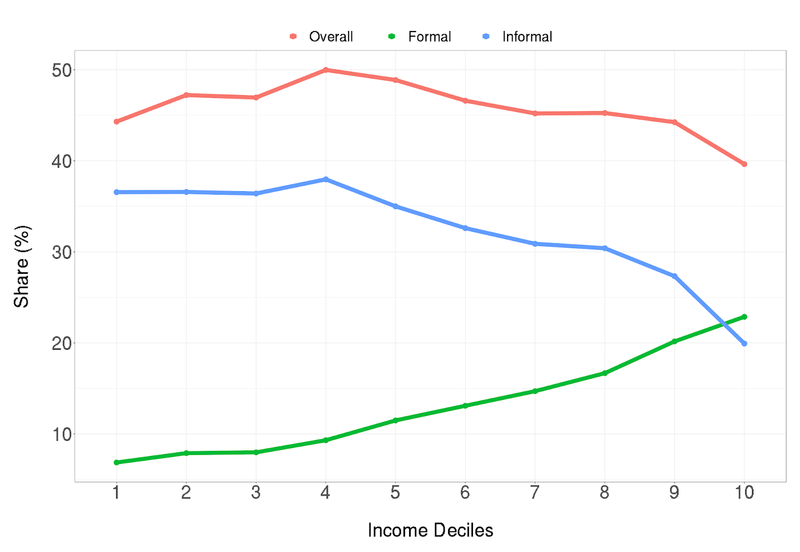 Everybody else uses the informal sector more (Fig 3). If 50 years of nationalized banks have not changed it, something is definitely wrong! what appears from the above blog is that bank are mainly giving loans to rich. This would be truu also of public sector banks. However, the NPAs of public sector bank is very high. Does this means that rich are dishonest.